Key information on asthma combination inhalers. Quickly compare combination inhaler options for your asthma patients with the MIMS table of LABA/corticosteroid asthma inhalers. 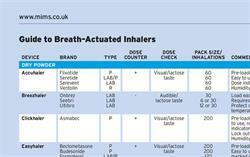 The table provides essential information for healthcare professionals prescribing a LABA/corticosteroid device for the first time, either when stepping up treatment in patients not adequately controlled on an inhaled corticosteroid and a short-acting β2 agonist, or when starting a combination inhaler in patients already adequately controlled on a LABA and a corticosteroid taken separately. It is also designed to help prescribers looking for an alternative LABA/corticosteroid device where the existing choice is unsuitable. Drug names link through to the full MIMS entries for more detailed prescribing information on each branded or generic product. Recommendations are derived from manufacturers' Summaries of Product Characteristics (SPCs). 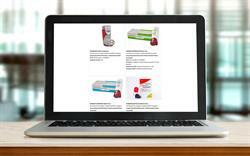 Available presentations of bronchodilators and anti-inflammatories. Key features of dry powder and aerosol inhalers. 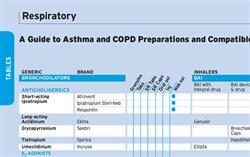 Are you up to date with the latest inhalers?